Rodent and bird activity in loft spaces and void areas can result in the insulation becoming contaminated. This is primarily through their droppings and urine. As well as contaminating your loft space, Rodents can cause direct damage to insulation through chewing and tearing it to use as nesting materials. As well as causing nasty odours, this insulation can become very hazardous. Contaminated loft insulation can cause serious health issues for yourself, your family, and anyone who needs to enter the affected area. Removing all of the existing contaminated loft insulation, as well as all droppings, and unwanted debris. All items that we remove from your property will be disposed of in the correct manner. We would apply a biocide disinfectant throughout the loft to kill of any secondary pest residues and bacteria. If you require, Total Pest Control can also install fresh insulation to ensure your home retains its warmth. 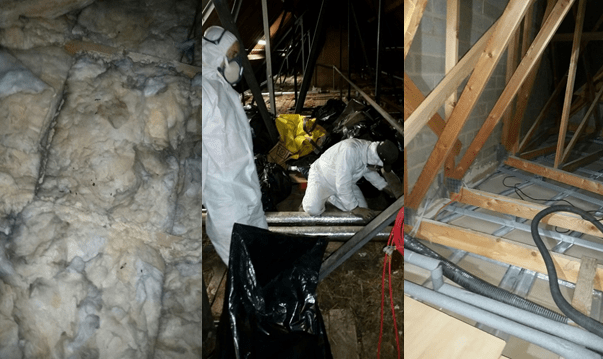 If you have interest in our loft insulation clearance for your home or business and would like to arrange a free, no-obligation survey please contact us on 01235 819511. Alternatively you can request a call-back by filling in our quick enquiry form.